Star Snooker Academy wishes snooker players from all over the globe a warm welcome to our coaching and elite practice facility. Our expert fully qualified snooker coaches provide full snooker coaching for all abilities in our state of the art practice facilities! Keith and Garry, formerly based at the World Snooker Academy in Sheffield have moved across town from the English Institute of Sport and Sheffield United Football Club's Training Academy and are now based at Steelers Sports Club, which is now the main practice base of China's number one and multiple ranking tournament winner Ding Junhui. Also based at Star Snooker Academy are; Thai legend James Wattana, WSF 2018 winner Luo Honghao, Tian Pengfei, 2013 Asian U21 Champion Noppon Saengkham and former world runner up Nigel Bond. Star Snooker Academy is pleased to announce bookings for Junior Summer Schools 2019 are now available, these include practice and accommodation. Week 1: July 8th-12th. Week 2: July 15th-19th. Week 3: 22rd-26th July. Week 4: 29th July- 2nd August. Week 5: 5th-9th August. 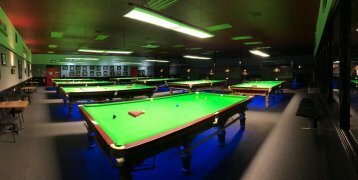 We are proud to be recognised by the EASB as a Centre of Excellence and current venue for the 2019 English Snooker Finals weekend and currently stage a number of events in the English Amateur Tour Ranking Series along with World Snooker Challenge Tour. Gold Member of the EPSB 147 club scheme. Please email to enquire or click here for more info.